When it comes to entertaining on a boat you may think your food options are limited, however let me assure you that your choices are many. Sharing your food is another way to share the love – I mean they often say a way to a man’s heart (or Captain’s heart) is through his stomach – so why not opt for platters and finger food to satisfy hunger and love in one go? We’ve trialed some simple savoury recipes and tested them for preparation time and hunger satisfaction. See what Captain Frank’s favourite finger food option was and why not make use of this recipe next time your planning a celebration!?! Great finger food that can be served hot or cold. Create your own flavour by mixing up the toppings you use – ideas include ham and cheese (as below), spinach and feta or sun-dried tomato and olive. Cut each pastry sheet into 8 rounds using a scone cutter. Lightly spray the patty tin. Place pastry in patty tin. 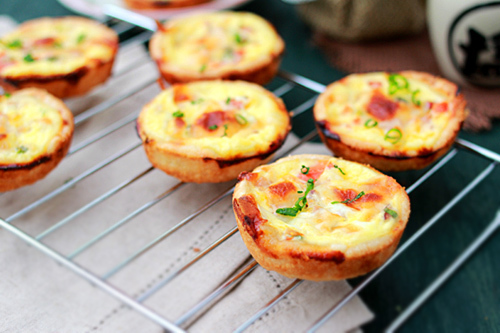 Place cheese, chopped onion and ham in the pastry shell. Beat egg and milk. Add salt, pepper and parsley. Pour mixture over the pastry shells and topping. Place tray in oven and cook for 15-20 minutes or until the filling is set.